With the arrival of September, migration’s pace will quicken. In late August, I started seeing warblers passing through my yard. In other locations in the region, birders have shared reports of shorebirds and wading birds. Photo by Bryan Stevens • Green herons are short, stocky herons that can assume some comical poses. Jonesborough resident Julia Ellis wrote about her own observation of a green heron that took place recently. 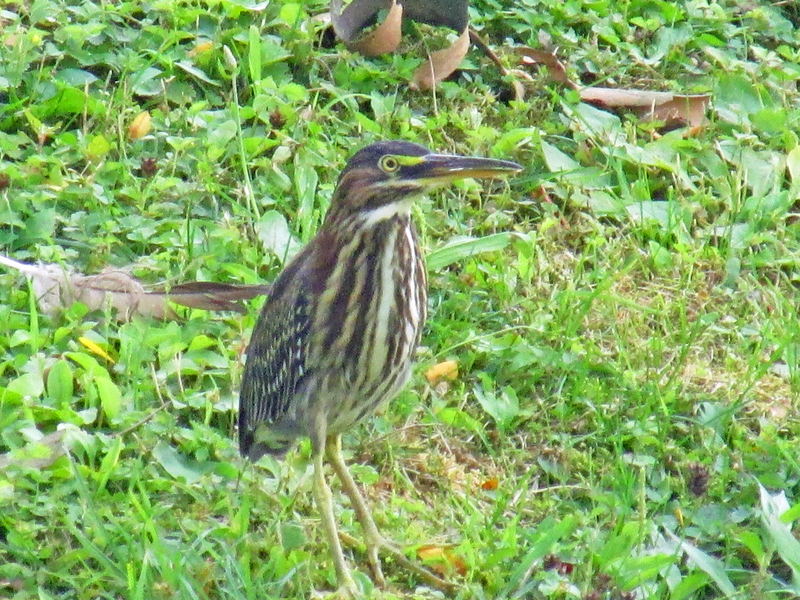 She had seen a photo of a green heron with one of my recent columns, which helped her identify the bird. The green in the bird’s plumage appears as a dark green cap, as well as a greenish back and wings. Adult birds also have chestnut-colored neck feathers and a line of white feathers along the throat and belly. These herons often assume a hunched position, which can make them look smaller than they actually are. Keep alert when walking along the trails in Erwin and you may catch sight of one of these interesting herons, too. Farm ponds in the countryside around Jonesborough, as well as wetland habitat around Persimmon Ridge Park, are also good places to look for this small heron. Most green herons will depart in late September and early October. This small heron retreats from the United States during the winter season but will return next spring in April and May. Photo by Bryan Stevens A young Green Heron rests at the edge of a pond. Photo by Bryan Stevens A Green Heron finesses a captured tadpole in its bill. Photo by Bryan Stevens A Green Heron elevates a shaggy crest of feathers, a behavior often initiated when the bird feels alarmed. A few herons — great blue heron and black-crowned night heron — remain in the region throughout the year, even enduring the cold winter months in Northeast Tennessee, Southwest Virginia and Western North Carolina. This entry was posted in Birding, Birds, Bristol Herald Courier, Bryan Stevens Feathered Friends, Elizabethton Star, Erwin Record, Green Heron, Herons, Johnson City Press, Jonesborough Herald and Tribube, Kingsport Times, McDowell News, Our Fine Feathered Friends, Tennessee, Tennessee Rare Birds, Uncategorized and tagged Autumn, Bird, Birdwatching, Bristol Herald Courier, Elizabethton Star, Erwin Record, Fall, Green Heron, Johnson City Press, Jonesborough Herald and Tribune, Kingsport Times-News, McDowell News, Migrants, nature on September 17, 2017 by Bryan Stevens. I enjoyed a recent trip to Atlanta, Ga. The extended weekend visited gave me the opportunity to see some birds I don’t see often at home in Northeast Tennessee, including Brown-headed Nuthatch and Pine Warbler. A Great Egret resting on a spit of land in a lake at Murphy Candler Park in Brookhaven, Ga. I observed a Great Egret at Murphey Candler Park in Brookhaven, Georgia. Hiking trails around a small lake at this park offer some convenient locations for scanning the lake for wading birds and waterfowl. 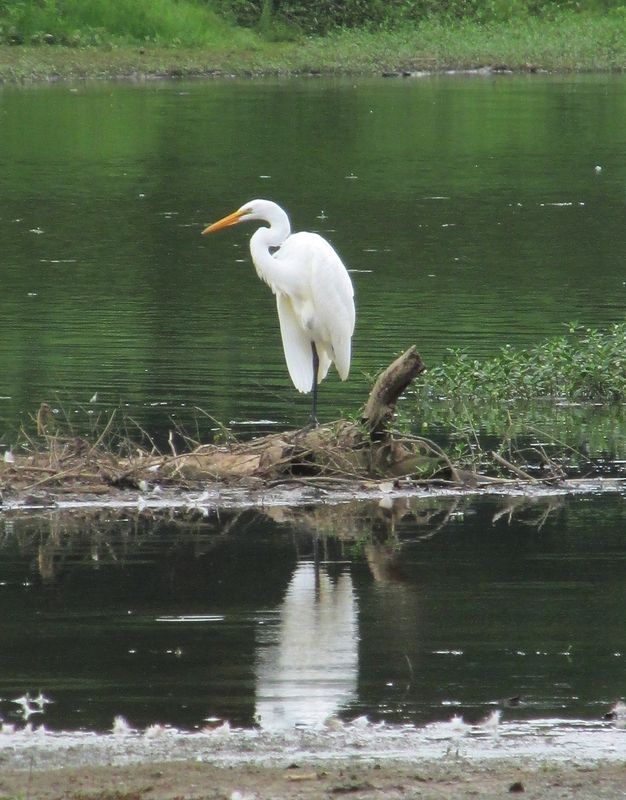 The egret was the first Great Egret I’ve observed in the Atlanta area. I had visited this park hoping to find dragonflies, but for the most part struck out on finding these winged insects. I was compensated not only with the egret, but with observations of Double-crested Cormorants, Canada Geese, Mallards, Belted Kingfishers, Cedar Waxwings and Song Sparrows. A Great Blue Heron moves stealthily through a wetland. Egrets are members of a family of birds known as Ardeidae, which includes herons, bitterns and egrets. The Great Egret is a very stately, graceful bird with white plumage, long legs and a sharp, yellow bill. It is smaller than the Great Blue Heron. The Great Egret stands 3.3 feet tall and has a wingspan of 52 to 67 inches. On average, however, they weigh only about 2.2 pounds. 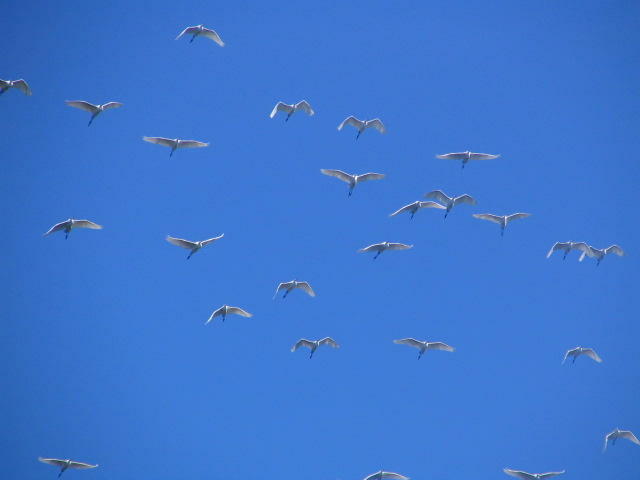 A large flock of Great Egrets flies over the Watauga River in Elizabethton. These egrets nest in large colonies. In the late 1800s and early 1900s, the colonial nesting habits of these birds made them particularly vulnerable to humans who slaughtered the birds in the millions to harvest their feathers for use in the fashion industry. The Great Egret and other wading birds were almost decimated in order to decorate fashionable hats for women. The National Audubon Society was founded in 1905, largely as an effort to combat the unregulated slaughter of birds like Great Egrets, Snowy Egrets and Roseate Spoonbills. Now, more than a century later, the Great Egret still serves as the official logo for the National Audubon Society. In addition, the Great Egret has rebounded from those dark years. In fact, this bird now ranges as far north as southern Canada in appropriate wetland habitats. During spring and fall migration, Great Egrets also pass through northeast Tennessee. Look for them along rivers, lakes and on small farm ponds. During visits to favorite birding locations in Elizabethton and Erwin, I have also observed Green Herons and Great Blue Herons. A young Green Heron rests at the edge of a pond. The Green Heron can easily be overlooked as it lurks near a stream’s banks or the edges of a pond. This heron is not tall and stately like the Great Egret or Great Blue Heron. The bird is a patient ambush predator capable of remaining motionless for extended periods as it waits for prey to move within reach of its sharp, pointed bill. I’m always flushing these herons from cover before I even realize they are present. I do get fortunate on occasion, however, and manage to approach a Green Heron without panicking the bird into a hasty flight. If you stand very still and don’t make sudden movements, you can manage to observe this bird from a respectful distance. Such was the case of a Green Heron that I found stalking the edges of the pond at Erwin Fishery Park. I had my camera, so I snapped some photographs as I watched the heron’s slow, deliberate steps along the pond’s edge. Then, with a lightning-quick motion, the bird lunged its bill into the water and snatched a large tadpole. The heron required a brief time to get the wiggling tadpole positioned. After that technicality was resolved, the heron swallowed the plump tadpole quickly and almost immediately resumed search for more prey. 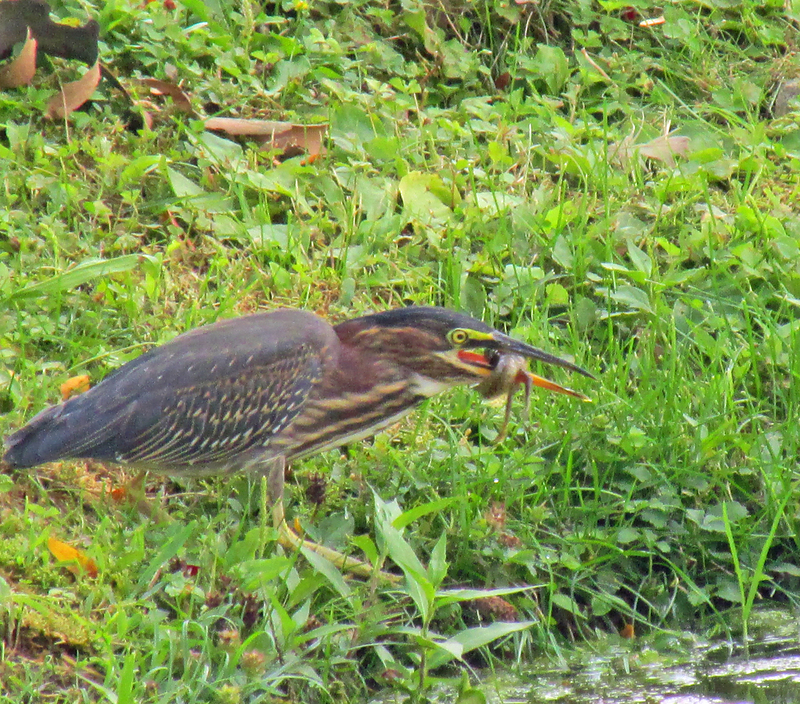 A Green Heron finesses a captured tadpole in its bill. The unfortunate tadpole had developed hind legs, which did not prove an obstacle for the bird swallowing it, but still had a tail. Although it was very close to achieving frog-hood, this particular tadpole instead became part of the varied diet of a Green Heron, which can also include fish, crustaceans, insects and even mice. At this same Erwin pond, I once watched another Green Heron patiently stalking and successfully snatching dragonflies that perched on pond vegetation within reach of the bird’s bill. A Green Heron elevates a shaggy crest of feathers, a behavior often initiated when the bird feels alarmed. 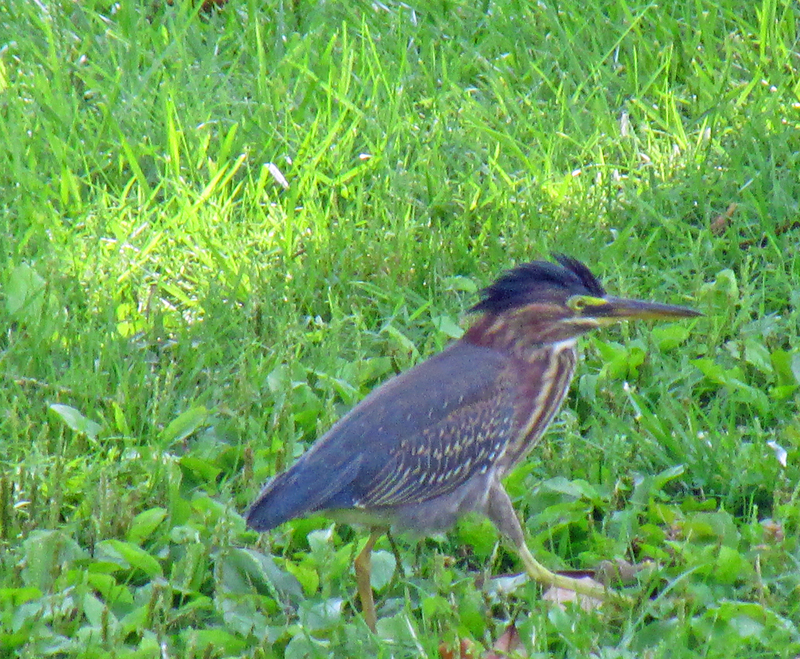 The Green Heron is usually present in Northeast Tennessee from April to October. The bird migrates to Central America for the winter months. A few other herons, including the Great Blue Heron and the Black-crowned Night-Heron, live year-round in the region. 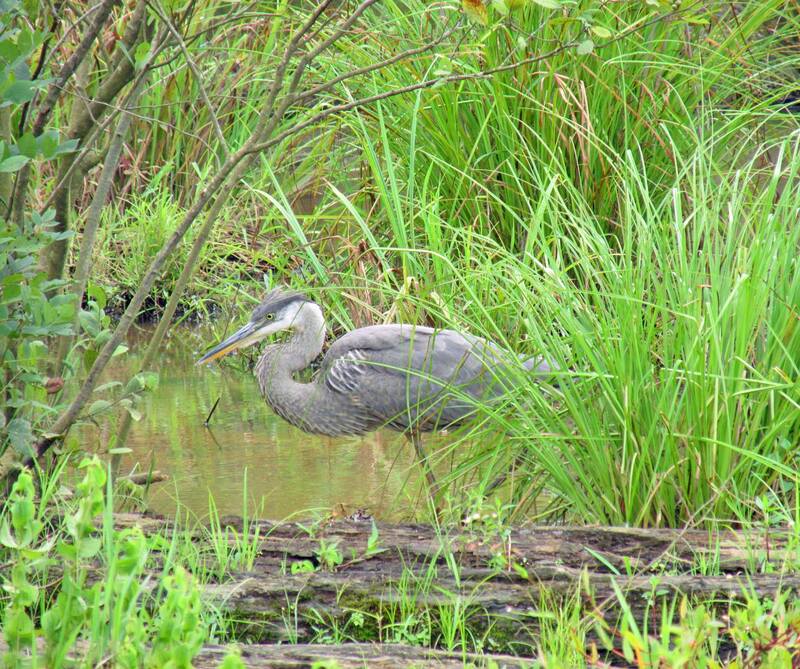 This entry was posted in Birding, Birds, Herons and tagged Ardeidae, Birding in Northeast Tennessee, Bristol Herald Courier, Carter County Compass, Elizabethton Star, Erwin Record, Great Blue Heron, Great Egret, Green Heron on August 10, 2014 by Bryan Stevens.